The cheerful Christmas theme will appeal to little elves of all ages, and can be used for birthdays, school parties, and family events. Check out our other themes: Dino Party, Fairy Princess Party, etc. Decorations: 10-foot-long Merry Christmas banner, goodie bags, place cards, posters, ornaments, party sign, and cup labels. 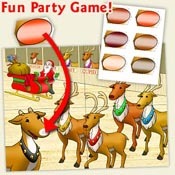 Activities: Santa's Little Helper hats and badges, finger puppets, flags, Pin the Nose on the Reindeer game, masks, and black-and-white coloring pages.